Radio Veronica was an offshore radio station that began broadcasting in 1960. The station transmitted from the North Sea for over fourteen years. It was set up by independent radio, TV and household electrical retailers in the Netherlands to stimulate the sales of radio receivers by providing an alternative to the Netherlands state-licensed stations in Hilversum. It must have been around 1973 that I could receive Radio Veronica with a diode receiver (similar to the 'jampot' receiver below) from the middle of the Netherlands. I had to use a 20 meter longwire antenna to listen to Radio Veronica. Broadcasts began on 21 April 1960. Used medium wave frequencies were 1562 kHz (192 meter) and 557 kHz (538 meter). The station announced itself as VRON (Vrije Radio Omroep Nederland; Free Radio Station [of the] Netherlands) but changed to Radio Veronica, after the poem "Het Zwarte Schaap Veronica" — The Black Sheep Veronica — by the children's poet Annie M.G. Schmidt. The station's closure, some of its staff applied for a broadcasting licence and continued as a legal organisation with the same name. 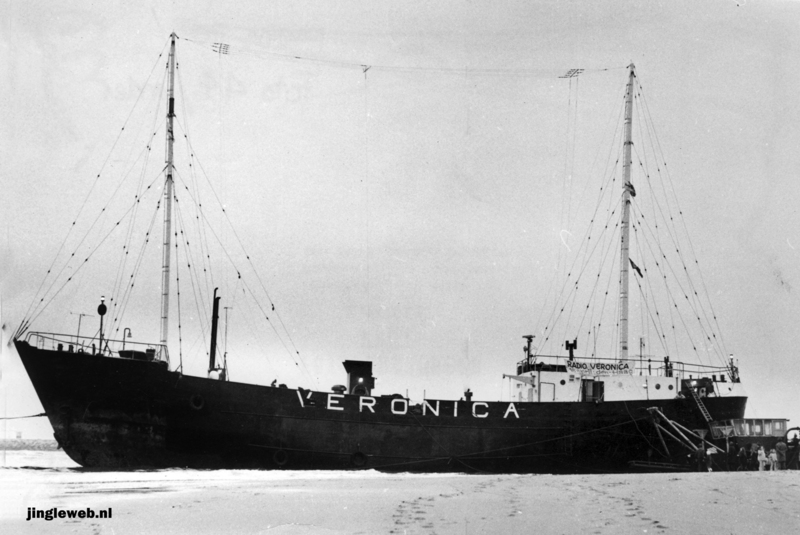 The original Radio Veronica became the most popular station in the Netherlands. It broadcast from a former lightship Borkum Riff and anchored off the Dutch coastline. The ship was fitted with a horizontal Medium Wave antenna between the fore and aft masts, fed by a one-kilowatt transmitter. Most of its programs were recorded in a studio in Hilversum. At the end of the 1960s the studios and offices moved to bigger premises in Hilversum. Initially advertisers were reluctant to buy airtime, but those that did reported increases in sales and gradually the station's revenue improved. For a short time the station also ran an English language service under the call letters CNBC (Commercial Neutral Broadcasting Company). Although short-lived, CNBC was presented by professional broadcasters who were able to give invaluable technical advice to Veronica's Dutch staff.